Actor Jeff Daniels loves his native Michigan so much that he produced a movie about deer hunting in the Upper Peninsula and stars in TV ads for the state's economic development. Philadelphia-born Mitch Albom, author of "Tuesdays With Morrie," set his latest best-selling novel, "For One More Day," in his adopted state. It pained him when the TV movie was shot in Connecticut instead. So it was in keeping for this pair of loyal Michiganders to want to help alleviate the misery in a state where the 8.5% unemployment rate remains three percentage points higher than the nation's. Michigan, they decided, could become a mini-Hollywood of the Midwest, churning out movies, TV shows and commercials the way the slowing factories around here once spit out pickup trucks and SUVs. Three months ago Messrs. Daniels and Albom got a posse of state legislators and Gov. Jennifer Granholm to push through the nation's most generous rebate for video and film production: up to 42% of the costs a producer incurs on everything from key grips to honey trucks. And Hollywood is marching in. Just two months later, Michigan already had signed 24 agreements under the new law, representing projects that call for a purported total of nearly $200 million in spending here -- and state-treasury paybacks totaling more than $70 million. Also, the Michigan Film Office reports that 84 scripts were submitted for its consideration just a week after the new law passed, compared with only seven all of last year. This doesn't surprise Mike Binder, a Michigan native and Hollywood director. "People ask me, 'Why did you set "The Upside of Anger" in Detroit but shoot it in London?'" he says. "Because they gave me a tax break." But it isn't clear that the legislature has done the right thing in selecting the Albom-Daniels script for economic recovery. The obvious weakness of this ploy is that many cities and states are hankering for Hollywood's table scraps. Pittsburgh is trying to create "Hollywood on the Mon(ongahela River)." New Mexico and Louisiana are well ahead on this path. And there's nothing stopping Kentucky, Colorado or Florida from leapfrogging Michigan, which previously hiked its rebate to 20% in 2006. Critics also have lambasted the new incentives as a Band-Aid that can't come close to covering the state's gaping wounds. Detroit car makers' U.S. market share now stands at a near-historic low of 47%, and Michigan has lost 69,000 payroll jobs in the past year alone. Yet because Michigan retains great competency in complex manufacturing, the law of comparative advantage would argue for redoubling efforts in that arena rather than chasing moviemakers. Others have knocked the basic unfairness of selecting a single industry for privileged treatment. "It involves picking winners and losers in the marketplace so there is less for everyone else," complains Michael LaFaive, director of fiscal policy for the Mackinac Center for Public Policy, a think tank in Midland, Mich. Besides, the state treasury already is facing a projected deficit of more than $400 million for the fiscal year that begins Oct. 1 -- after huge new boosts in personal-income and business-receipts taxes. The movie rebates are "an insult to every business that just got a big tax increase," says Patrick Anderson, principal of Anderson Economic Group, in East Lansing, Mich.
Michigan's celluloid pedigree is skimpy -- and checkered. "Somewhere in Time," shot at the Grand Hotel on Mackinac Island in 1979 and starring Christopher Reeve and Jane Seymour, showed the state's breathtaking beauty. Thanks to the Big Three auto makers, Michigan once ranked as a leading site for TV ads. But moviegoers are much more apt to recall tumbled-down images of Detroit, a city that has lost about half its population over the past half-century. Recently, the producers of "Transformers" joined a roster of peers who have used the crumbling Michigan Central train depot in southwest Detroit, and its now-toothless beaux-arts façade, as an apocalyptic metaphor. And there's "DEA," the new Spike TV series that followed Drug Enforcement Agency officers as they busted down crack-house doors in Detroit. With "the highest murder rate in the country," Detroit "is a deadly city," an announcer intoned. It's no wonder that one of the first new movies announced in the new rebate era was "The Job," whose director wants to take advantage of the "vivid streets" here to depict people living "far on the margins." Rebate backers don't mind continuing to offer genuine Motown grittiness. But they believe that producers will press many other settings into use, including Michigan's quaint tourist towns, vast deciduous forests and lengthy shoreline. Johnny Depp reportedly has been scouting sites around one watery haven, Traverse City. The new law also includes breaks for digital moviemakers who can work -- inside -- anywhere. "If you have five films shooting at the same time, with five full working crews, that's a small industry of people constantly working," says Mr. Albom. "And then you've built a creative force that can justify moving to, living in, and staying in Michigan." Beyond that, however, lies the even bigger question of whether Michigan could ever harbor a critical mass of the creative class for the long term. Are screenwriters, make-up artists, movie agents and paparazzi ever going to haunt Woodward Avenue in Detroit the way they blanket Beverly Hills? Connecticut has been able to attract some long-term investments in movie-making not just because it preceded Michigan as the most generous rebater -- at 30% -- but also because it's part of greater New York and Boston. "It's important to be in close proximity to creative centers of the world, and schools and universities that feed them," says Joan McDonald, Connecticut's economic and community-development commissioner. For Michigan to succeed, says Richard Florida, a University of Toronto business professor and author of the new book "Who's Your City," it "will have to knock off a Toronto." He concedes that currency exchange no longer favors the Canadian dollar but notes that, just a few hundred miles from here, Toronto already has leveraged hefty rebates into "a huge infrastructure and very deep networks" that cultivate a thriving film industry. One local newspaper wag couldn't decide whether the state would become known as "Michiwood" or "Wishigan." In any event, Michigan's Louis Mayer wannabes were encouraged recently by a gathering at a suburban Detroit sound stage. It was publicized only on the state's film office Web site, "but 800 people came out," Mr. Albom reports. "Everyone from hairdressers to actors to producers to camera operators -- they were all there. That tells me there is an enormous base of people who are anxious to work in these fields here and just waiting for the work to come." Six hundred new jobs and $480 million. That’s the number of new jobs and the revenue projection by Fisher Coachworks L.L.C., a new company that’s developing a 40-foot ultralightweight hybrid bus designed for urban use, which boasts twice the fuel efficiency of current hybrids. Fisher, which has its first prototype nearly complete, is searching for a 50,000-square-foot production building in the area and is awaiting the results of a request for a $6 million loan from Michigan’s 21st Century Jobs Fund. It currently has offices in Troy. The company, which is introducing the bus to media today, wants to begin production by next summer. It has $6 million in hand from a U.S. Department of Energy grant and private investment. The loan is part of the $10 million Fisher needs to begin production, and a decision on it is expected Oct. 8. “We hope to build the vehicle in Michigan,” said CEO Greg Fisher. That hinges on funding and finding a site. California and Tennessee also are interested in landing the project, said Bruce Emmons, president of Rochester Hills-based engineering firm Autokinetics Inc., where four prototype buses are being built. They declined to offer details on the out-of-state interest. Fisher predicts it will garner $480 million in revenue by its seventh year if it reaches 15 percent market share for hybrid buses, according to information the company provided at the recent Michigan Growth Capital Symposium. The company is the brainchild of Greg Fisher, whose family name can attract interest. He’s the grandson of Fisher Body Co. co-founder Albert Fisher, who along with his brothers ran the car body company whose iconic coach symbol was stamped on General Motors Corp. vehicles for most of the 20th century. Fisher later became a GM division. Now, that insignia will adorn the sleek silver buses. “We’re essentially getting the band back together after 100 years,” Fisher said in jest. He’s also president of Troy-based Fisher/Unitech Inc., which specializes in improving production for manufacturers. Autokinetics, which first began work on the hybrid bus seven years ago, was one of Fisher’s clients. At the heart of the new enterprise is the Fisher GTB-40 bus. Because it uses a lightweight nitrogen-strengthened stainless steel unibody and has no traditional engine for propulsion — it relies on Swiss-made batteries to drive motors for each wheel — the buses are half the weight of other hybrids and diesel models and get twice the mileage. A small diesel engine is used to power a generator that keeps the batteries charged longer. Energy from the brakes is captured for reuse. “It’s really a different mousetrap, a different widget,” Fisher said. The buses are estimated in simulations to get 10 miles per gallon versus the 4 to 5 mpg for hybrid buses on the road today, resulting in a projected savings of $2.5 million in fuel costs over the typical 12-year lifespan of a bus. That savings is despite a $550,000 per-unit price tag compared with today’s hybrids that cost about $200,000 less. The savings because of green technology has transit authorities interested. So far, the company has talked to 10 public bus agencies, including Detroit, Ann Arbor, Lansing and Grand Rapids. With demolition work already underway on Tiger Stadium, famed Tigers broadcaster Ernie Harwell and his attorney Gary Spicer are still working to preserve the ball diamond and a corner of the stadium. 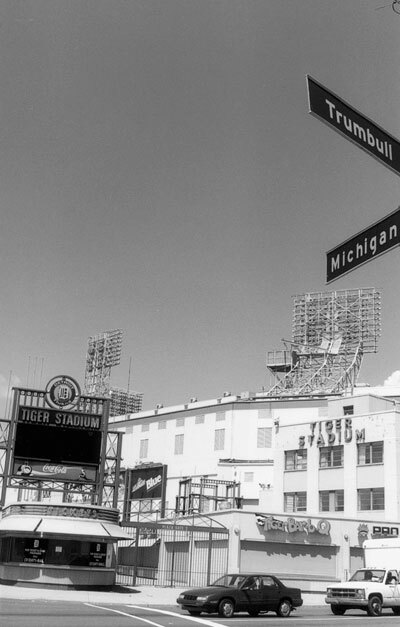 Checks are to be made payable to the Ernie Harwell Foundation, a 501 (c)3 non-profit organization, and sent in care of S. Gary Spicer, 16845 Kercheval Ave., Suite 5, Grosse Pointe, MI, 48230, Harwell said.Spicer said Old Tiger Stadium Conservancy had not solicited contributions because it had not yet received nonprofit status. The conservancy has received encouragement from U.S. Sen. Carl Levin’s office, Spicer said, that federal funds could be earmarked for the preservation project. The first donations will go to preserving the playing field and starting a $2.4 million fund to build a 20,000-square-foot museum for Harwell’s memorabilia collection, now housed at the Detroit Public Library, Spicer said.“That’s Phase One and that’s what we want to explain to the city council before they act on further approval for demolition,” Spicer said. Earlier Tuesday, the Detroit Economic Development Corp. asked the Detroit City Council for final permission to allow complete clearance of the site at Michigan and Trumbull avenues. The city gave the conservancy until Aug. 1 to raise about $369,000 to save the playing field and the Michigan Avenue-Cochrane Street corner. With the council in recess on Aug. 1, action was needed now, EDC chairman Eddie McDonald said. The conservancy also was to show the potential for raising annual funding to operate the preserved portion of the stadium, officials said.“We had a memo of understanding with the conservancy since last July,” said Scott Veldhuis, project manager at the Detroit Economic Growth Corp., which staffs the DEDC. “There is no funding in place to take care of the building physically, or for operations,” he said. The DEDC approved a demolition contract in April with MCM Management Corp. of Bloomfield Hills and Detroit-based Farrow Group Inc. The council and Mayor Kilpatrick approved an extension of time for potential preservation until Aug. 1. The demolition partnership will tear down and remove the entire stadium except the area between the first-base and third-base dugouts at no cost, in exchange for the right to sell the scrap metals, estimated to be worth at least $1 million. However, the companies will pay $300,000 if allowed to tear the whole stadium down during the same project. Plans for a light rail system in Detroit progressed this week when a regional planning group green-lighted the proposed development. Officials with the Southeast Michigan Council of Governments approved a Detroit Department of Transportation plan to construct and operate light rail service on Woodward Avenue between downtown and Eight Mile. "This is an important step toward the establishment of a reliable rail transportation system that will assist Detroiters in getting to and from their destinations," Mayor Kwame Kilpatrick said in a statement. "This approval of DDOT's rail project will also multiply economical opportunities for business growth." SEMCOG representatives could not be reached for comment Tuesday. According to SEMCOG, the proposed line is expected to be the first in a regional plan that includes rapid transit in three counties and would "serve as a distributor and feeder" to an Ann Arbor-to-Detroit commuter rail line the council is studying. "I am pleased that DDOT is moving in the right direction on the Woodward Avenue Light Rail Transit (LRT) initiative by putting the customer first, as gas prices continue to soar," said Lovevett Williams, interim director of DDOT, in a statement. " The Woodward line would follow an eight-mile stretch from the Michigan State Fairgrounds near Eight Mile to downtown Detroit, feature stops at 13 to 15 stations and carry about 22,200 daily riders, SEMCOG said. Building costs are estimated at $371 million. Federal funds are expected to cover more than half the project's cost. An environmental impact statement is being drafted, and pending final designs and application to a Federal Transit Administration program, construction is not expected to begin until 2011, according to SEMCOG. "The Woodward Avenue LRT project will stimulate community and economic development in southeast Michigan," U.S. Rep. Carolyn Cheeks Kilpatrick said in a statement. One Less Kick-Back for Kwame: Rackham Remains a Public Golf Course. Let's All Breathe A Sigh of Relief. Detroit's Rackham Golf Course in Huntington Woods must remain a publicly owned links even if the city sells it, the Michigan Court of Appeals said in a ruling released Wednesday. That was a relief to Huntington Woods residents and to golfers playing in Wednesday's heat, who said they feared plans by Detroit officials to sell the 120-acre course adjoining the Detroit Zoo for conversion into a housing development. "We're extremely happy with the decision," said Huntington Woods Mayor Ron Gillham. "We know Detroit could sell it to us or some other governmental unit. Our attorneys are going over this decision but if it's sold, it must be a public golf course," said Gillham, who has lived in Huntington Woods since 1959. James Canning, a spokesman for Detroit Mayor Kwame Kilpatrick, said city attorneys are still reviewing the court's decision and officials have not decided whether to appeal. The appeals court said the Rackham family gift to Detroit in 1924 has "unambiguous language and the clearly stated intent" was that the land could not be used for anything but a public course. The three-judge panel added that Detroit may only sell the property "to another public entity and not to a private entity," even if the private buyer promises to keep it as a public golf course. A private developer offered to buy the course from Detroit in 2006. At the time, the sale was envisioned as a way to shore up Detroit's 2005-06 fiscal year budget. The ensuing legal challenge by Huntington Woods and several of its residents caused Detroit financial officials to not rely on the proposed sale in projected revenue estimates in later budgets, Canning said. Huntington Woods challengers to the deal argued, successfully it turns out, that a sale would violate the terms of the Rackhams' gift. Horace Rackham, who made a fortune in the early auto boom, donated the land and developed the course so average citizens could play at a facility rivaling the elite private clubs of the era. Playing in their weekly Wednesday golf league at Rackham, players young and old said they were relieved. "I like Rackham a lot. You can score well here, and they keep it in real nice shape," Cary Almas, 28, of Clawson said before starting his golf round. The course was designed by fabled golf architect Donald Ross, who also designed the course at Oakland Hills Country Club. The clubhouse was designed by Albert Kahn, Detroit's best known architect of buildings, whose stamp is on the Fisher Building and Detroit Police headquarters. "It's classic golf," said an admiring Wes Williams, 63, of Rochester Hills. Because of the course's prominent designers, and its history as the first integrated public course in metro Detroit, Huntington Woods voted to make it a historic district in 2006, said Huntington Woods Zoning and Preservation Administrator Hank Berry. "This course allowed African Americans to play from its inception. That was unheard of in the 1920s," Berry said. Ben Davis, a black Detroiter named head golf pro at Rackham in the 1960s, "was the first African American to hold that position at an 18-hole public golf course anywhere," Berry added. "Ben taught me. And he still plays the course. He's 96 and still hits the ball straight." Huntington Woods City Manager Alex Allie called the court ruling "very comprehensive. ... Obviously, we're very pleased. It is a relief. It essentially upholds all our arguments." As for the more than $6 million Huntington Woods earlier had offered to buy the course from Detroit, "It's a different ballgame now. It's a very complex sale condition," he said. Huntington Woods is not actively pursuing buying the course as it waits to see how Detroit will respond to Wednesday's ruling, Huntington Woods officials said. The court's decision said that any sale would have to be approved by Rackham heirs and could go only to a public body for purposes of maintaining a public golf course. Those restrictions vastly reduce the $11.25 million that developers in 2006 offered Detroit with their plan to build as many as 400 houses, according to a 2006 recommendation from the Detroit Planning and Development Department. An attorney for the development group that would have built the houses said the court's decision seemed clear-cut. "Certainly it seems the upshot is that it remains a golf course in perpetuity," said Arthur Siegal, whose Southfield-based firm Jaffe Raitt Heuer & Weiss represented the developers' partnership, called Premium Golf LLC. Siegal said the partners withdrew their bid in 2007 and that now, in light of the region's housing slump, they'd probably be less interested. "I'm sure the value of the property, for any purpose, has declined significantly," he said. Ken Silver, Chairperson for Citizens to Save Rackham, said, "Huntington Woods hit a home run." Silver, a 23-year Huntington Woods resident, and his wife live three blocks from Rackham Golf Course with their son and two daughters. Bounded on the south by I-696 and on the east by the Detroit Zoo, with its other two sides facing the homes of Huntington Woods, Rackham Golf Course is managed by American Golf Corp.
Steve Williams, a regional director for the company in Rochester Hills, said that golfers play more than 50,000 rounds a year there, but would not say how many players use the course. Just a 30-minute drive from downtown Detroit, Pleasant Ridge isn't exactly a suburb—it's one of Michigan's smallest incorporated cities, with 2,594 residents. Resident Kate Redmond calls it "a time capsule from the 1920s,"when upper-middle-class automobile tycoons built homes and raised families here. It's long been a draw for folks on the family track; it's not uncommon for newlyweds to buy a starter home here, trade up to a larger one when the kids arrive, then downsize as the nest empties, but never leave Pleasant Ridge. Public schools spend almost $2,000 more per student than the national average, and class sizes average just 18 students per teacher. Make it work, metro Detroit, because one of your fashion designers is finally getting some love from "Project Runway." The fifth season of the hit Bravo show starts at 9 p.m. Wednesday and features a contestant from our own backyard. Joe Faris, 41, of Troy, a veteran sportswear designer, is one of 16 contestants who'll battle to impress Heidi Klum, Tim Gunn and the rest of the "Runway" gang. Faris, a married father of two daughters, says he's a jeans, T-shirt and leather jacket kind of guy whose style is influenced by his hometown. He's even got a catchphrase that just may replace "fierce" (season four winner Christian Siriano's favorite word). Think "done-o-done" will sweep America? Come back to the Free Press on Wednesday for more about Faris and the kickoff of "Runway." Encompassing the Ferndale, Huntington Woods and Berkeley sections of metropolitan Detroit, the dense corridor stretches 27 miles over 11 municipalities and is home to the largest number of jobs. It means something in Motor City that upwards of 12% of residents use public transport; the ridership rate in nearby Sterling Heights is below 5%. The average commute time in Berkeley, 19 minutes, is half as long as that of other downtown neighborhoods. Every weekend, Kelli Lewton-Secondino and her crew of chefs pull 16-hour days, preparing meals for more than 100 customers signed up with Royal Oak-based Pure Food 2 U. The seven-month-old food-delivery service is an extension of Lewton-Secondino's existing business, Royal Oak's 2 Unique Catering, but with a new take. The chef had long been an advocate of locally grown, organic foods, and was ready to start a business modeled on her increasing conviction that healthy eating was the way to go. With revenue for Pure Food's first year projected at $550,000, Lewton-Secondino found a growing market of diners with a taste for fresh, healthy meals but a dearth of kitchen time.Businesses like Pure Food are at the leading edge of a national demand for locally grown foods that's spawning new businesses and increasing demand at existing operations. It's a trend that's too new to have produced much hard data, but from grocers to farmers to state agencies, mention the increasing demand for local food and you'll get a nod of recognition.“If you go back to leaders like (national organic and gourmet grocer) Whole Foods Market, they've been talking about local and doing it for at least three or four years, but in the last year, we're seeing it kind of explode on the consciousness,” said Neil Stern, a senior partner with McMillan Doolittle L.L.P., a Chicago-based retail consulting firm. .And profits are growing all the way down the food chain.Michelle Lutz, co-owner of Maple Creek Farm in Yale, west of Port Huron, said she's looking for revenue to grow from $430,000 in 2006, her best year to date, to a projected $550,000 this year. Maple Creek lost $170,000 in 2007, the victim of a severe season-long drought. Lutz sells to high-end stores throughout the metro area like Orchard Lake-based Plum Market, to restaurants and also to individual customers through retail sales and farmers' markets like Royal Oak's. “It's not abnormal for me to move 20 tons of produce or more a week during the (growing) season, and to a small family organic farmer that's a lot,” she said.Expenses at an organic operation such as hers typically exceed those at mainstream farms, but Lutz said she's able to compensate for the higher labor outlay to some degree because she doesn't use costly petroleum-based fertilizer or pesticides, and tries to keep costs comparable to mainstream producers. But Lutz is selling more than produce. Part of the sticker price includes a sense of security about the product,“If I can get close to what (the average mainstream) consumer is paying, I find people don't mind giving their money to me,” she said. Lutz said that she might earn about 30 percent of the retail price of her products at a major retailer, while at a smaller, family-owned store the split might be closer to 50-50. Restaurants are about 60-40, but she sees her greatest profits in individual, direct sales. Most of Maple Creek's produce, she said, is sold within 80 miles of the farm with the farthest destination the Plum Market in Ann Arbor. Smaller farms also report an increase in activity. Robin Leonard of the Garden Patch Farm in Pinckney said she's getting about five calls a week about her eggs and produce, and Diane Franklin of Rocky Gardens CSA in Davisburg in northwest Oakland County said all 51 farm co-op shares, priced at $560 each, were sold a month after she'd opened for sales. Franklin said her annual revenue is about $25,000, typically reinvested into the farm's infrastructure.Julie LaPorte is another entrepreneur who's capitalizing on the growing demands for local foods, providing a connection between local farmers and time-strapped consumers. LaPorte, committed to a local diet personally, found herself making the rounds to several local farms on the weekends. When she started picking up food for friends, LaPorte realized she'd developed a business model and started Clarkston-based La Vida Local. The fledgling home delivery service currently fills about 25 orders per week, placed online, from a database of about 100 members. Weekly revenue from her seven-month-old business hovers between $1,300 and $1,600.Cutting out the middleman allows LaPorte to sell food at a lower price than a gourmet market, though she admits her wares exceed the mainstream market price. “Raw cheese from Whole Foods is usually around $14 a pound, but my price is about $8.50 a pound,” she said. LaPorte said her business has been growing slowly, but that she's content to see growth that taxes neither her resources nor the capacity of the roughly 30 suppliers she works with. Gary Kuneman, general manager of Scio Township-based Eat Local Eat Natural is hoping to fill the delivery niche on a commercial level. Kuneman has been working on the project for about two years, building his supplier base, but started making sales calls last month.“We're chomping at the bit because we've got the suppliers,” he said. About 40 percent of the agricultural commodities grown in Michigan are consumed in-state, said William Knudson, an agricultural economist at Michigan State University. The rest are shipped out of state or out of the country. In a national 2006 survey of specialty food stores conducted by Chicago-based consumer, product and market research firm Mintel, 31 percent of the food items in specialty retailers were sourced within 250 miles of the store, Knudson said. Five years ago, he said, the company didn't track that statistic, a sign of the increasing prominence of local food in the marketplace. The number of farmers' markets in the country increased by 82 percent between 1996 and 2006, with a 40 percent increase between 2002 and 2006, he said. There's no hard and fast rule regarding in- versus out-of-state food pricing, Knudson said — factors like whether produce is in or out of season can modify the price — but for in-season produce, locally grown can be cheaper. Monroe County-based Calder's Dairy and Farms, family-owned and -operated since 1946, is a familiar name to Southeast Michigan grocery shoppers. The dairy's brands are carried in mainstream grocery stores and are fixtures at gourmet markets. The dairy's home-delivery service added more than 220 orders to its 1,500 home-delivery customers just in the first quarter of this year, said general manager Nicola Noble. “Local” doesn't always mean organic, Stern said, but it offers a sense of consumer security that “outside” products may not have. Locally grown food also has a better environmental and sustainability reputation, thanks to the smaller carbon footprint required to truck foodstuffs shorter distances. And in an age of recalls, local food may seem safer, Stern said. “There's traceability,” he said. “If you know where food is coming from, you think it may be safer. ... That doesn't necessarily mean it's going to be safer, but the implication is, "I know where this stuff is coming from.' “Noble said that changing Calder's feed to an all-organic mix isn't financially feasible — all the farm's milk-producing cows must be fed on more costly organic feed from birth on before the dairy could qualify as organic — but said she thinks part of the appeal of the dairy is that customers are able to see the humane way cows are treated. Ari Weinzweig, co-owner of Ann Arbor's Zingerman's Community of Businesses, has been at the head of the local, organic trend since Zingerman's Deli opened in 1982. For Zingerman's, Weinzweig said, it's about contact.“I think our push is to know everybody we buy from, everybody we sell to, even if that's your mail-order customer,” he said.“And when we can make connections at that level it's always for the better. Pontiac Silverdome is Sold! Future Face-Lift To Follow! area attorney is set to buy the former home of the Detroit Lions for $20 million. The Pontiac City Council voted 4-2 Thursday night to approve selling the Silverdome to H. Wallace Parker of Bloomfield Hills. The city and Parker have 90 days to survey the 127.5-acre property before closing on the deal. Parker plans a $175 million development at the site to add restaurants and other amenities, as well as renovate the 80,000-seat domed stadium to hold concerts and sporting events. The Detroit News reports Parker looked visibly surprised when the council approved his project. Two previous sale attempts in 2005 fell through, and talks with Parker broke down in February. The Lions left the Silverdome in 2002 to move to Ford Field in Detroit. Once hailed as “The Paris of The West” and a national center for investment and development, Detroit has become a symbol of failed urban policy over the past 40 years of decline. Vacant skyscrapers and factories dotting Detroit’s skyline testify to the city’s high water mark, a stirring juxtaposition of old and new, decayed and opulent. But some Detroiters deeply appreciate these storied, vacant structures. “They represent the raw material, the building blocks for rebuilding the City,” says Francis Grunow, president of the Detroit preservation group Preservation Wayne. Grunow advocates “adaptive reuse”—remodeling a building after it has outlived its original purpose —for the benefit of small businesses and organizations. Reuse has its critics, though. “Some very real health and safety issues [arise] in adaptive reuse,” says Wayne State University Professor Robin Boyle. Many developers cannot conform older structures to today’s building codes, which have much more stringent fire regulations, for example. Another common obstacle is funding. Boyle believes traditional funding bodies, such as banks, can’t accurately estimate the cost of adaptive reuse projects, so they are disinclined to fund them. Victor and Vandyke had to personally finance Avalon Bakery and The HUB, while MOCAD “would not be possible without the support from the Manoogian Foundation,” says Dawson. City policy also seems to favor demolition over adaptive reuse. In 2002, Detroit issued more permits for demolition than for all other building permit types combined, undoubtedly facilitated by the permit fee structure in Detroit: renovating a 22,000-square-foot building—the size of MOCAD—costs $6,980, but demolition costs only $108. A permit to redevelop a structure the size of MOCAD in Ann Arbor, Michigan, by comparison, would be $783. The blame does not fall entirely on the City of Detroit. The state funneled more money into the pre-Super Bowl demolition of one of Detroit’s grandest and most historic hotels, the Hotel Statler, than they put into the entire Cool Cities Initiative, Governor Jennifer Granholm’s lauded program that offers grants to preserve historic structures, start “cool” businesses, and revive public places. Southeast Michigan Realtors are expecting a stronger summer selling season, according to pending and completed residential sales data released July 8. According to Farmington Hills-based multilisting service Realcomp II Ltd., sales were up throughout the region by 13.1 percent at the end of June this year, compared to the end of June 2007. There were 5,341 sales in the region during the first six month of this year, compared to 4,723 last year. The region includes the city of Detroit, St. Clair area and Wayne, Oakland, Macomb and Livingston counties. Pending sales are up across the region though, so it's expected that completed sales should increase during the next two months. Throughout the region, there are 7,191 home sales pending, compared to 5,437 at the end of June last year, representing an increase of 32.26 percent. In Oakland County, there are 1,668 home sales pending, compared to 1,356 at the same time last year. Livingston County pending sales are 10.8 percent higher this year than last, with 195 reported at the end of June. Macomb pending sales number 910, 27.63 percent more than last year. Realcomp reported 2,774 pending sales in Wayne County, 27.07 percent more than at the end of June last year, and Detroit pending sales are 22.52 percent higher than last year, numbering 1,398. Wayne County and Detroit home sales have increased for six straight months, having a positive impact on overall sales figures. Wayne County sales were up by 31.4 percent this year and Detroit sales are up by 54.9 percent compared to last June. There were 990 Detroit sales the first half of this year, and 2,055 in Wayne County. The San Francisco Bay Area is expected to compete with major cities of the Rust Belt in the pace of growth in millionaire residents over the next five years, according to the World Wealth Report by Merrill Lynch and Capgemini. But there is a silver lining. San Francisco is building on a much larger base. And at least this year's report found the number of Bay Area millionaire households grew 11 percent to 123,476, based on research by Claritas. San Francisco's millionaire households are expected to climb 16.4 percent over the next five years vs. overall growth in the number of households of 2.8 percent. Detroit has 81,320 millionaire households and that figure is expected to grow 16.3 percent over five years; Pittsburgh, 37,885, 18.1 percent; and Cleveland, 53,859, 17 percent. New York's 320,184 millionaire households are expected to grow 15.7 percent and Los Angeles' 212,895 millionaire households are expected to rise 22.4 percent. Last year's Merrill Lynch/Capgemini (NYSE: MER) report found a decline in the number of millionaire households in the Bay Area, prompting concerns the wealthy were moving to friendlier tax climates in places like Nevada and Wyoming. Not that taxes aren't coming into play for cities such as Orlando, where the growth of millionaire households is expected to jump by a third from today's 53,013 millionaire households who can enjoy the Florida sunshine and lack of an income tax. Other winners in this ranking include Sacramento, with an anticipated increase of 30 percent from its current 48,737 millionaire households. Phoenix is expected to see a 32.1 percent increase in its millionaire households that now stand at 64,014. Globally, the World Wealth Report found the number of rich people around the globe grew 6 percent last year to 10.1 million, with India, China and Brazil chalking up the fastest growth in wealthy citizens. India's population of high net worth individuals grew 22.7 percent; China, 20.3 percent, and Brazil, 19.1 percent. Those figures reflect in part the dramatic gains in stock markets in emerging nations. The Shanghai and the Shenzhen Stock Exchanges grew at 303 percent and 244 percent, respectively, last year. India's Bombay Exchange and National Stock Exchange had respective growth rates of 122 percent and 115 percent in 2007. The number of the world's ultra high net worth individuals -- those with at least $30 million -- increased 8.8 percent. Millionaire households are those with net assets of $1 million or more, excluding primary residence and consumables.